If you’re from Edmonton, chances are pretty good that you’ll recognize this amazing couple. They are Sharon & Mack and we’re so excited to photograph their wedding this fall. Sharon & Mack are actively involved in our community andÂ you’ll find them behind the scenes at many great events including What the Truck and Eat Alberta. They are both foodies who are very active on social media and are advocates for Edmonton’s downtown. Sharon & Mack each run very popular blogs and Mack has made several appearances on local media to discuss trends and statistics related to social media and Edmonton. In addition to all of their community service, Sharon & Mack are a super sweet couple who we’ve been fortunate to knowÂ for several years and who’ve been big supporters of our photography. For their engagement session, Sharon & Mack wanted to do something that reflects two of the things they are passionate about. 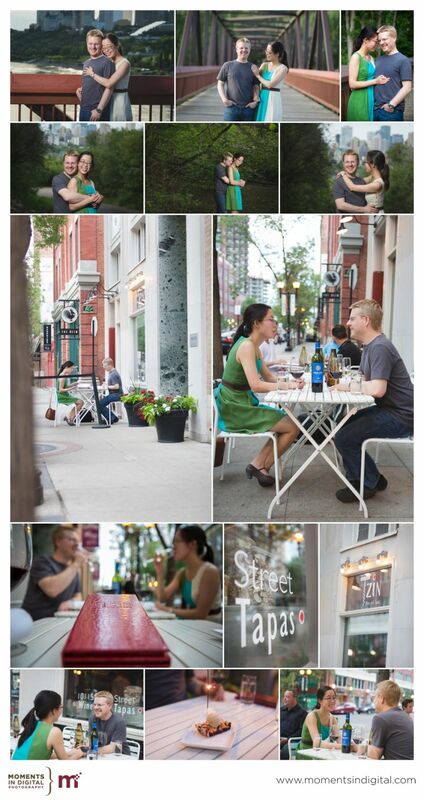 Edmonton’sÂ vibrant downtown and the local food scene. We started their session on the footbridge that connects Louise McKinney Park and Henrietta LouiseÂ Edwards Park which provided a great backdrop with the city skyline. Afterward, we headed to one of their favourite spots in the city for some wine and tapas – Tzin Wine Bar on 104th Street. This is great!! Amazing photos and stunning subjects!! very cool, congrats Mack and Sharon! Great sneak peek Bruce & Sarah, thanks for a fun session! Looking forward to the wedding! so great! sharon’s dress is AWESOME! perfect pic’s of a lovely couple – congrats again. Great pics, but not surprizing considering the subjects. Congrats.